More than 170 thousand people in the U.S. are expected to be diagnosed with leukemia, lymphoma or myeloma in the next year. But a new kind of immunotherapy known as chimeric antigen receptor T-cell or CAR T therapy is bringing renewed hope to blood cancer patients and oncologists alike. On today’s program, we are going to speak with one of the pioneers of immunotherapy research leading investigations into CAR T and other emerging immune treatments for both liquid and solid tumors. You are listening to ReachMD. I am Dr. Shira Johnson and with me today is Dr. Robert Vonderheide, Director of the Abramson Cancer Center of the University of Pennsylvania and the John H. Glick MD Abramson Cancer Centers Director Professor at the Perelman School of Medicine. It’s a pleasure to be with you Shira. To get us caught up to speed, help us understand what CAR T therapy is and why it is generating so much excitement in the oncology field? Well, CAR T therapy is a brand new type of therapy for cancer. CAR stands for chimeric antigen receptor, and what this means is that we use a lentivirus to infect T-cells from patients with cancer and that lentivirus includes a transfer of a gene that encodes a receptor for leukemia, in this case. And the way that works is the receptor is actually an antibody moiety that binds to the molecule CD19 on the surface of leukemia cells, B-cell leukemia and that directs the T-cells toward the leukemia and substitutes for the T-cell’s normal T-cell receptor and confers this tumor specificity, and in that setting the tumor cells die. This is causing so much excitement for two reasons, one is, it’s a brand new type of therapy, but more importantly, is that it is showing clinical results that are unprecedented in childhood lymphoblastic leukemia and the same type of leukemia in young adults. Does this therapy represent a paradigm shift in how oncologists will approach blood cancers, or is it more an extension of the existing treatment types? Well, we really see this therapy as revolutionizing our approach for cancer care. This is the first of a kind therapy. We don’t think it will be the only type of cellular therapy, but what this is, is using the immune system to attack cancer and doing so by developing a genetically-engineered autologous T-cell that is infused back into patients. So, nothing like this has been approved by the FDA before, and the first approval last month in August, 2017, is really a watershed moment in gene therapy and in cellular therapy for the treatment of cancer. What outcomes’ data have we seen up to this point for patients being tested on CAR T therapy? So, the treatment of patients with this therapy produces a rapid and very durable regression and remission of the acute leukemia. And what we have observed in children with this disease, and these are children who have a refractory form of the disease, is that well over 70% of the patients go into a complete remission, and for those patients that do, that remission appears to be very, very durable. In some cases, we’ve already observed that complete remission is lasting many years and this is what is so unprecedented, these patients treated with other types of agents, chemotherapy agents, do not experience this type of treatment effect to any degree like this. Dr. Vonderheide, when you are giving patients this type of therapy, can you tell us something about the toxicity and the effects that you are seeing with this treatment? Overall, the therapy has been well tolerated, but there is a new syndrome that we had to learn about which is a cytokine release syndrome. So, in some patients after they are treated with CAR T-cell therapy, the immune system is so aggressive in killing the cancer that there can be multiorgan dysfunction on the basis of very high levels of cytokines, and this can be quite serious. Fortunately, on the same day the FDA approved this first cellular therapy, they also approved tocilizumab as a therapy to treat the cytokine release syndrome, which concomitant to the clinical trials was discovered to be very effective for this syndrome, and it just represents, with any new therapy, there are new side effects and new toxicities and we have to work just as hard on managing this new toxicity profile as we do developing the therapy, and fortunately, that has occurred in this case. If you are just joining us, you are listening to ReachMD. I am your host, Dr. Shira Johnson, and I am speaking with Dr. Robert Vonderheide. We are talking about CAR T-cell therapies and cancer immunology. Dr. Vonderheide, what other types of cancers are being tested with CAR T therapies in clinical trials? Well, right now this therapy is only approved for acute lymphoblastic leukemia in children and young adults, but there is great hope that this platform, this type of T-cell engineering will be useful and effective in many other types of cancers. We already are witnessing terrific results using this same approach for refractory lymphoma and we are now moving into other types of cancers including solid tumor malignancies. The challenge before us, as we go to the next type of cancer, is that the receptor that the lentivirus confers is currently only appropriate for B-cell malignancies, so certain types of leukemia and certain types of lymphoma. These cells, engineering cells this way would not be effective for solid tumors such as breast cancer or brain cancer. But the engineering is such that one can substitute in a different receptor that is specific for a different type of cancer, then the therapy is very much the same. Cells are taken from a patient, engineered, expanded and put back in. So, there are a number of clinical trials at the University of Pennsylvania Abramson Cancer Center and across the country, and frankly, across the world where different targets and different receptors are being tested. We have clinical trials active for CAR T-cell therapy for breast cancer, pancreatic cancer, glioblastoma multiforme, melanoma, prostate cancer; so you can see the list is quite long. We are still at the very earliest stages of moving this therapy into solid tumors. I think the early results are promising, but they are very early. We are being extremely cautious about potential safety issues that might arise and so the results are coming in, in a steady fashion and, hopefully, over time we will see the type of effect that we have observed for patients with leukemia. That’s certainly very exciting because as clinicians we know some of those cancers have been very resistant to treatment in the past. Can you tell us some more about the various lines of research that are being conducted in your lab and what you are particularly excited about in the near term? Well, my laboratory focuses on immune activation and identifying novel therapeutic ways to activate the immune system against cancer. CAR T-cell therapies are one example, but, of course, our appearing that into context of a great number of new therapies, many of which are earning FDA approval for immune therapy of cancer. These include antibodies to checkpoint blockade and things like that. As we move forward, a great deal of attention in my laboratory, is focused on ways to vaccinate individuals against their cancer to activate the immune system by using agonists and these we feel will be good adjuncts to additional therapies such as checkpoint therapy, or even CAR T-cell therapies. So, the review of the field right now is that great synergy will be expected as we combine these different types of immune therapy. It’s very exciting news. Are there other investigations for new immunotherapies that you think could make a big impact down the road that you haven’t already shared with us? Well, right now a great deal of attention is focused on treating cancer that’s already appeared and using these combinations, as I discussed. But if we take a step back and think of, what is the true power of the immune system and why we have an immune system in the first place, it points you to prevention. So, the most provocative and ultimately the most exciting deployment of immune approaches would be different types of strategies that prevent cancer from forming in the first place. You know, sort of the polio vaccine for cancer. And, in fact, the more we understand and have learned about the interaction between the immune system and cancer, and the more we understand about where cancer comes from and the genetic insults that result in cancer, there are, in fact, tractable and feasible ways to think about, for example, vaccinating individuals who don’t have cancer, but who are, for some reason, at high risk for cancer, to activate the immune system first and eliminate and lower the risk of developing cancer. These clinical trials of these types of approaches have begun and extremely exciting. The laboratory work endorsing them is very robust. And so, I think that over the next 2, 3, 5 years we will see immuno prevention as a true breakthrough, building on what has already been accomplished. Thank you for being with us today Dr. Vonderheide. My thanks again to my guest, Dr. Robert Vonderheide, Director of the Abramson Cancer Center of the University of Pennsylvania and the John H. Glick, MD Abramson Cancer Center’s Director Professor at the Perelman School of Medicine. We have been discussing CAR T-cell therapy. Be sure to visit our website at ReachMD.com featuring podcasts of this and other series. I have been your host, Dr. Shira Johnson, and thank you for listening. You have been listening to Medical Breakthroughs from Penn Medicine. 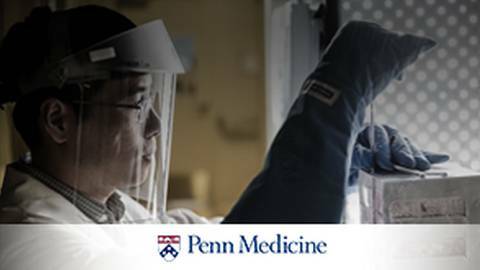 To download this podcast, or to access others in the series, please visit ReachMD.com/Penn and visit Penn Physician link, an exclusive program that helps referring physicians connect with Penn. Here you can find education resources, information about our expedited referral process and communication tools. To learn more, visit www.PennMedicine.org/physicianlink. Thank you for listening. For years, the foundations of cancer treatment, surgery, chemotherapy, and radiation therapy were utilized with the objective of weakening cancer. But over the past several years, immunotherapy – therapies that enlist and strengthen the power of a patient’s immune system to attack tumors - has emerged as a new tool for fighting cancer. In August 2017, one such treatment approach, called Chimeric Antigen Receptor or CAR T-cell Therapy, received FDA approval for the treatment of children and young adults with acute lymphoblastic leukemia (ALL). Additionally, research is continuing to look at CAR-T therapy’s effectiveness for treating solid tumors as well. Host Dr. Shira Johnson sits down with Dr. Robert Vonderheide, Director of the Abramson Cancer Center of the University of Pennsylvania and the John H. Glick, MD, Abramson Cancer Center Director’s Professor, to talk about the potential of CAR-T therapy alongside other emerging immunotherapies in fighting cancer.